All Harmonized Sales Tax calculators on this site can be used as well as reverse HST calculator. It is very easy to use it. You have a total price with HST included and want to find out a price without Harmonized Sales Tax ? 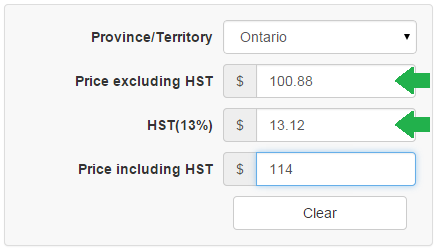 Enter that total price into “Price including HST” input box at the bottom of calculator and you will get excluding HST value and HST value. 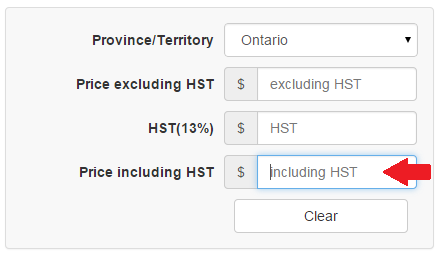 On the right sidebar there is list of calculators for all Canadian provinces where HST is introduced. WHERE CAN WE FIND THE OLD CALCULATION FOR THAT SPLITS THE HST AND RITC.. WHERE DID IT GO..
we updated our calculators and added back HST split. Do not like this version at all. The older version was simpler. What do you mean simpler? We removed one radio button, so now you can just enter number and get result instantly. Do you like more this calculator?